Jean Harlow. Joan Blondell. Warren William. 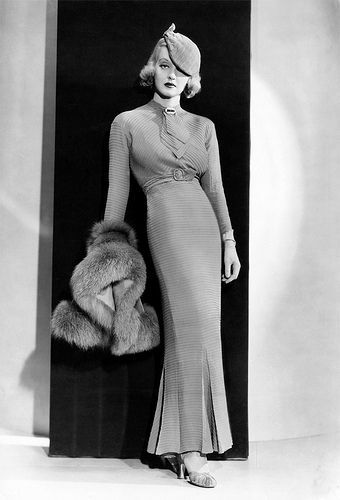 Dorothy Mackaill. Kay Francis. Ricardo Cortez. Madge Evans. Leila Hyams. Lyle Talbot. Anita Page. Norma Shearer. Pick a star, any star. Or any movie released between 1930 and 1934 – that absolutely awesome, totally titillating, sinfully scandalous era of filmmaking known as pre-Code. 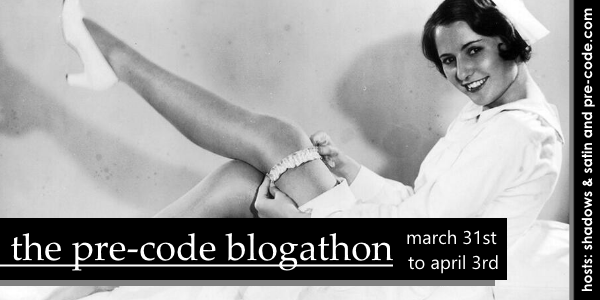 The 2015 Pre-Code Blogathon is a celebration of this brief but oh-so memorable period in the annals of cinema – one that featured more lingerie than you can shake a stick at! 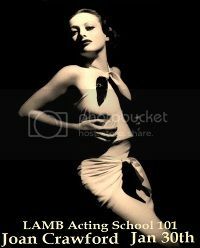 Around these parts, we think that the films produced in the early 1930s are some of the best from Hollywood’s Golden Age – and if you share our fondness for these features and the performers who made them so unforgettable, you are cordially invited to join in the fun! 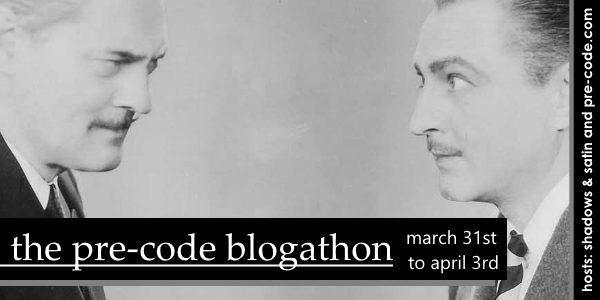 If you’d like to take part, please leave a comment below or send an email to either of your hosts, including the name of your blog, the topic you plan to write about, and your email address. 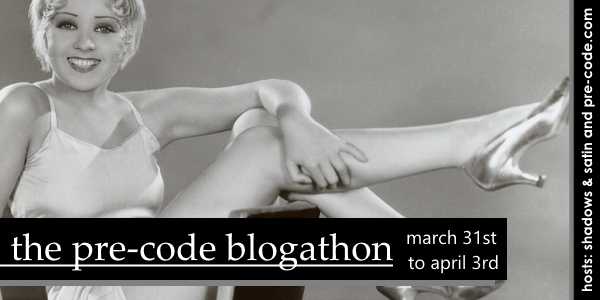 And help yourself to one of the banners below to advertise the event on your blog! ~ by shadowsandsatin on January 7, 2015. Could I do THE STRANGE LOVE OF MOLLY LOUVAIN or SAFE IN HELL? Oooh, I love both of those! Which would you like to do (or do you know yet)? Hmmmm…tough choice but I think SAFE IN HELL…if I get time I could do both? Sounds fun! I could go with either Red-Haired Alibi (1932) or Passport to Hell (1932). I might as well do both, if that’d be okay with you. Hi! May I take RED-HEADED WOMAN? I’m feeling like a little Una Merkel. 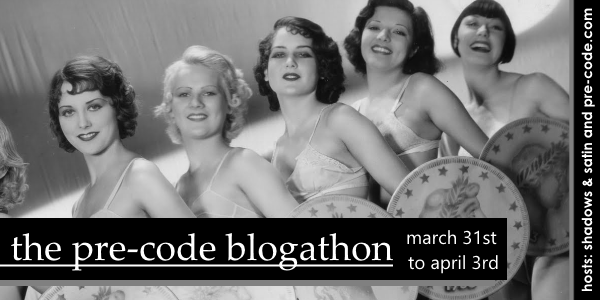 Or maybe GOLD DIGGERS OF 1933? May I contribute with 2 posts- I’m No Angel and Employee’s Entrance? So many good ones, it’s hard to choose! You sure can, Kellee — two excellent choices, I might add! I’ve got you down! I’m going to join the bandwagon and do both! Thanks a lot! I’m in! But haven’t decided on a film yet will be a Mae West one, unless I can combine a few in a post about her? You sure can, Thomas! Welcome aboard! I’ve never seen this one, but I’ve heard so much about it — can’t wait to see what you have to say! I’d like to write about “Call Her Savage” if it is available. I’m so excited! I love pre code! If that wasn’t the month I was moving to a new state I would do even more! What the hell – Island of Lost Souls (1932) for me! That’s an easy one. Too many good ones to choose from, but please could I write about The Divorcee? You absolutely can — that is one of my favorite movies. I watch it ALL the time — I look so forward to your post. Welcome aboard! This is going to be so much fun! What a terrific line-up of bloggers + movies you have already! I’d like to cover “Blonde Venus” (1932) if it’s not been taken already. An excellent choice — I look forward to your write-up! May I have a go at “The Mask of Fu Manchu”? You betcha! Welcome aboard, CW! 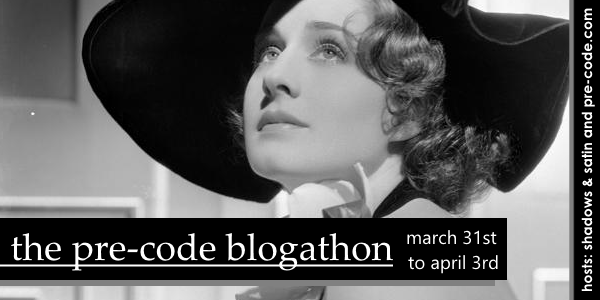 Yes, another blogathon I am adding to my slate. However, this reblog/announcement comes well in advance of the late March-Early April window. It fits in well leading into Poverty Row April as well, as usually I have many pre-code titles in there as well. I am covering Blonde Venus (1932) and am looking forward to it greatly. I would certainly like to join in. I was going to pick King Kong, but I think I’ll go with I Am a Fugitive from a Chang Gang, if that works for you. Sounds like a great choice — what a good film! We look forward to your write-up. Welcome aboard! 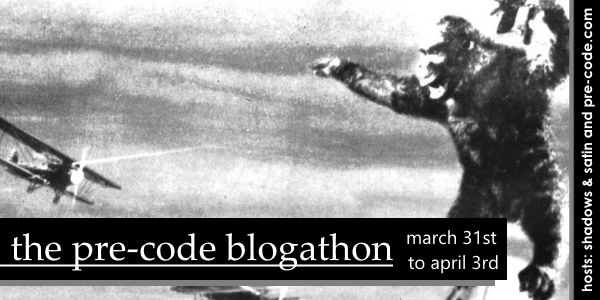 Hi, Joey — what movies would you like to write about for the blogathon? Hi Karen! Would love to chat with you about collaborating with the Movie & Music Network ‘s Vintage Film and Classic TV channels – hope to chat with you. That sounds great! I’d like to do a post on two Sternberg/Dietrich films, The Scarlet Empress and Morocco. My site is Public Transportation Snob. Hi, Dan — two great choices. Can’t go wrong with Dietrich! Welcome aboard! Hi! looking forward to this, should be fun to read everybody’s entries. I’m at secondsightcinema.com… The Bitter Tea of General Yen and The Scarlet Empress… lgaspar@me.com. Sounds great — we look forward to your entries, Lesley! You betcha — we have you down for all three films. Welcome aboard! No problem at all — the more, the merrier! Welcome aboard! Oh brilliant – I am so in!! Could I post about Queen Christina? 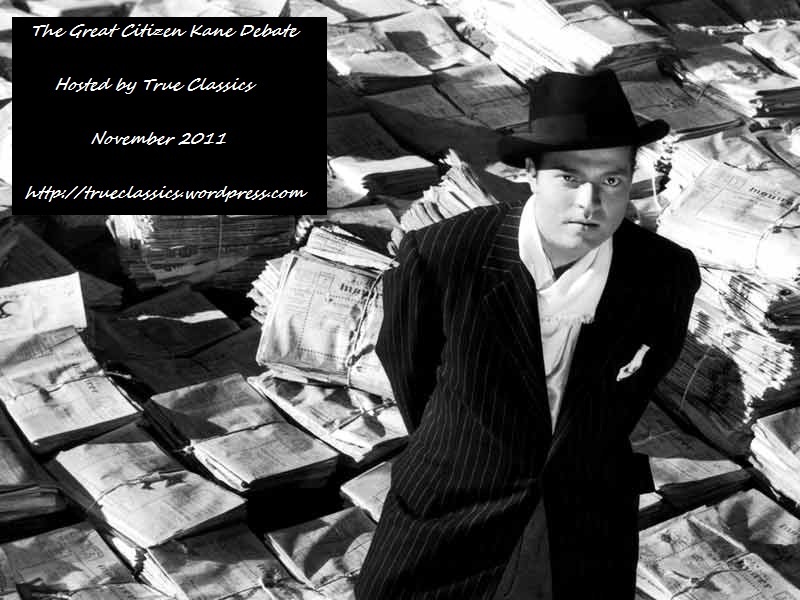 My favourite Pre Code and possibly favourite film!! Hi, Claire — you sure can! I’m a fan of Queen Christina, too — looking forward to your treatment. Welcome aboard! Hi, Theresa! Shanghai Express it is – looking forward to your write-up! Welcome aboard! Hey, I didn’t reread the whole comments thread just now, but had noticed a while back that someone else is also writing on Shanghai Express and now Theresa is as well… so just to confirm multiple entries on a single movie—is okay, cause it looks like at least three on this one. Hi, Random — I hope you see this. 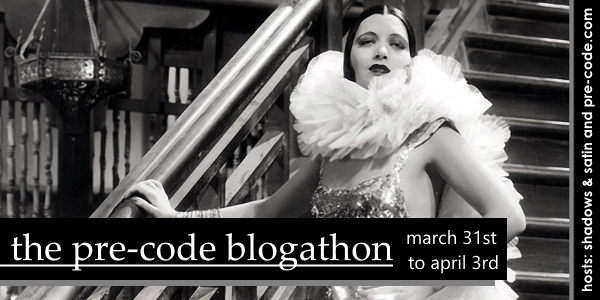 I’m assigning the dates for the Pre-Code Blogathon — do you want to do your movies on three different days, or the same day? And do you have a preference for the day(s)? Different days, please, but no date preference. So excited! 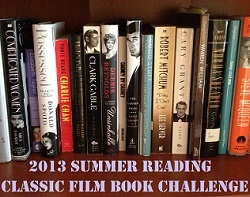 It it’s not too late to jump in on this, I’d like to take on The Little Giant with Edward G. Robinson. 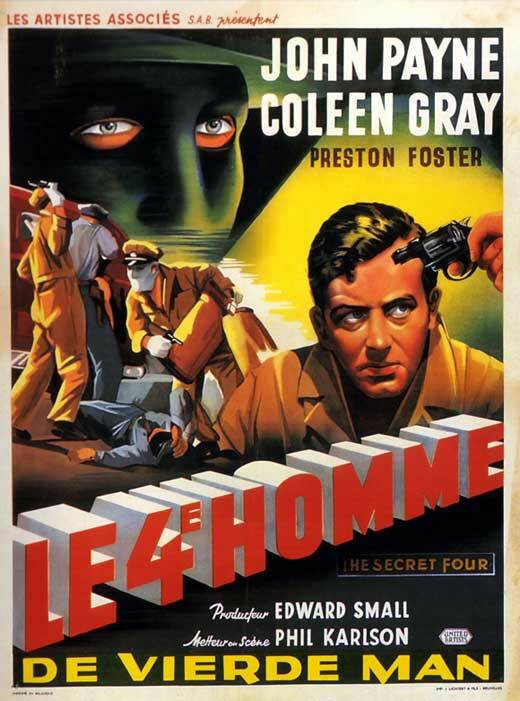 It’s somewhat tame by pre-code standards, but it’s a great film that seems to have been largely ignore. Please let me know what you think. If I’m not too late, I’d like to write about the Marx Brothers (specifically on their pre-Code films, of course).